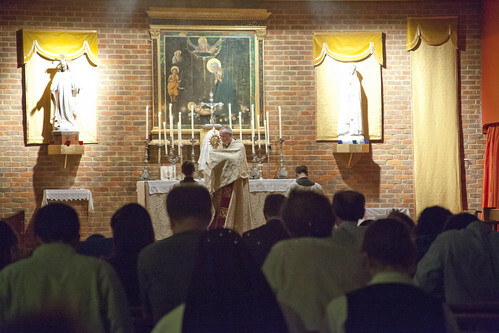 Last weekend I was at the Evangelium Conference, in the Oratory School near Reading. As I've mentioned before this is a unique opportunity for young Catholics to meet each other and a good number of sound priests and active Catholic laity. I never fail to meet interesting and engaging people at these conferences - this is the third I have attended, and given talks at. This year I spoke about the Natural Law and the Enlightenment. The classrooms in which I was speaking were, quite literally, packed, which is a great testament to the enthusiasm of the attendees to hear something intellectually substantial - my talks are marked on the timetable with three pairs of spectacles, indicating how 'difficult' they would be (a distinction shared by the talk given by Fr Armand de Malleray). 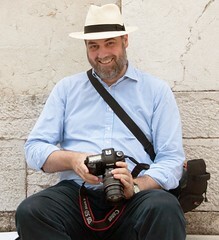 Whether I fulfilled my audience's expectations is not for me to say! But they asked pertinent questions, and many of them were seriously well-informed for non-specialists. The Evangelium project, of which the conference is a facet, is not 'Traditional Catholic' with a capital T, and there is an interesting range of opinion represented there. 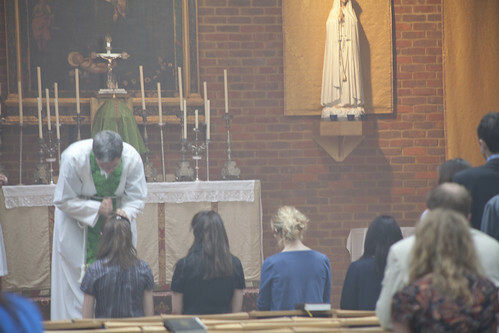 There are, of course, a large number of young people (and speakers) friendly to the Traditional Mass, and there were many Traditional Low Masses on each of the mornings before breakfast, which were attended by a good number of people. 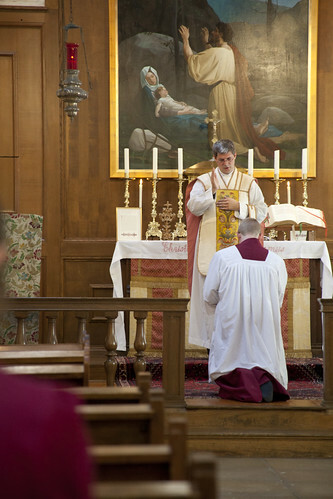 On Saturday I know there were four Low Masses at different times and places; on Sunday I attended one and saw another begin. The Latin Mass Society had a stall there, and I was helped in looking after it by three attendees who were LMS supporters. 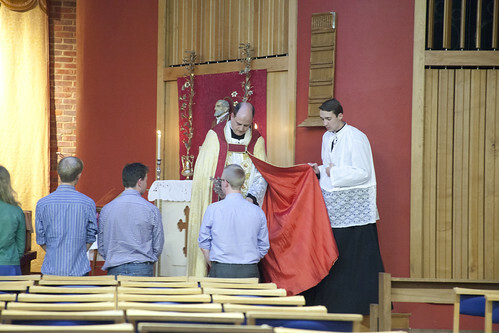 Among other things pleasing from a traddy point of view was Benediction of the Blessed Sacrament each evening, the veneration of a relic, and the first blessings of two newly ordained priests, Fr Henry Wisenant (of East Anglia) and Fr Tom Lynch (Southwark). It is not exactly a coincidence that these two young priests, with the chrism fresh on their hands, were among those celebrating the Extraordinary Form before breakfast. 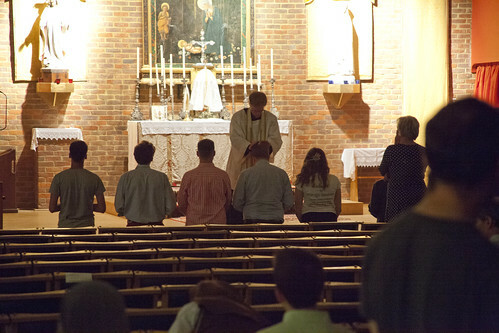 Fr Wisenant was particularly confident in his celebration of the EF, he looked as though he had been doing it for years. 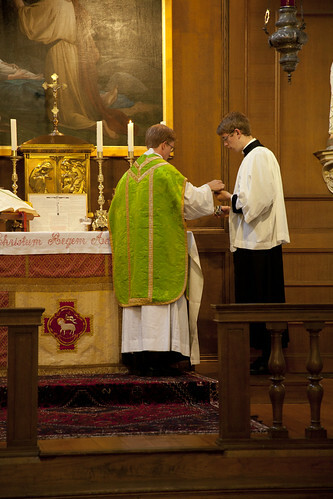 He had, of course, attended the Latin Mass Society's Priest Training Conference in Leicester this year.